Leafy Baby Blanket, designed by Leyla Alieva. I recently finished up this blanket and gifted it to a coworker who is about to go on maternity leave this week. It’s a relatively simple lace pattern, despite looking rather complex. 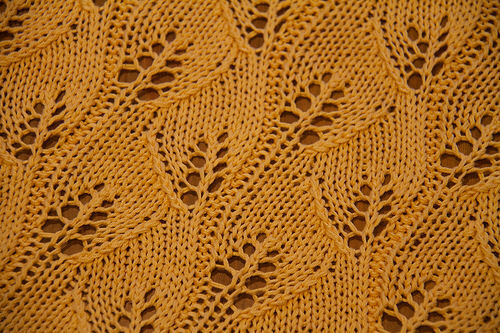 What I found to be most unusual with this pattern was that the lace stitches are worked on both the right and wrong sides, a technique I hadn’t yet encountered in my lace knitting experience. I knitted this in Patons Grace, a mercerized cotton yarn with an excellent smoothness and sheen. This is in the colour Apricot. I have a stockpile of this yarn in both this colour and another called Champagne. The blanket is lovely, although I felt it should have been a bit bigger. 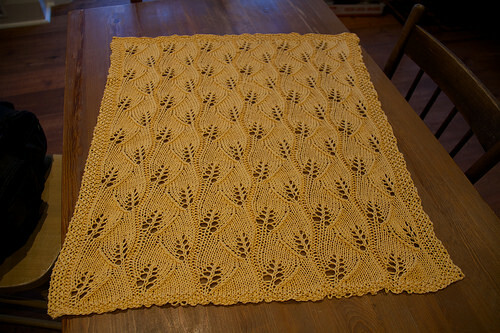 I followed the pattern exactly: Leafy Baby Blanket by Leyla Alieva. Since I gifted this one, I’m now remaking a version for my baby in the Champagne colour, and making it about 3 pattern repetitions wider. I’m a little bored of the pattern after knitting it for so long, but at the same time that makes it easy to knit, and lately I knit super slowly. It takes me eons to finish a project. I’m just so busy lately that I haven’t committed a lot of time to it. I want to knit a bunch of things for baby but I’m trying not to set my expectations too high. I also want to quilt a couple small blankets for him, so between these ambitions I have lots to keep me busy.